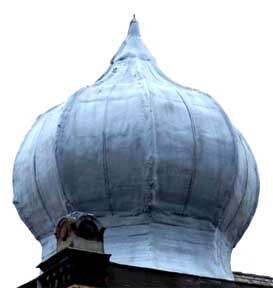 Bulbous, domelike roof ending in a sharp point, characteristically used in Russian Orthodox church architecture to cover cupolas or towers. 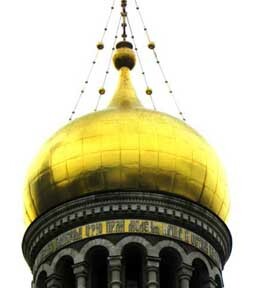 Predominant form for church domes in Russia (mostly on Russian Orthodox churches) and Bavaria, Germany (mostly on catholic churches), but can also be found regularly across Austria, Eastern Europe, Mughal India, the Middle East and Central Asia. Such domes are often larger in diameter than the drum upon which they are set, and their height usually exceeds their width. Onion domes are popularly believed to symbolize burning candles. Similar dome shapes: helmet-shaped, pear-shaped. Numbers: Onion domes often appear in groups of three, representing the Holy Trinity, or five, representing Jesus Christ and the Four Evangelists. Domes standing alone represent Jesus. Colors: Green, blue, and gold domes are sometimes held to represent the Holy Trinity, the Holy Spirit, and Jesus, respectively. The inner surface of the onion domes are often vividly painted with frescoes and murals.